للمسافرين الذين يرغبون أن يعيشو كل ما تقدمه Badger Creek, Lavender Farm Hotel هو الخيار الأمثل. يمكن من هنا للضيوف الاستمتاع بسهولة الوصول إلى كل ما تقدمه هذه المدينة النابضة بالحياة. يوفر الفندق بفضل موقعة الجيد وصولاً سهلاً إلى أهم معالم المدينة.
. يعمل Lavender Farm Hotel على ضمان إقامة مريحة لضيوفه من خلال خدماته الممتازة وحسن ضيافته. يمكن لضيوف الفندق الاستمتاع بالميزات التالية على أرض الفندق: صف السيارات, مرافق للشواء, خدمة غسيل الملابس, الحيوانات الأليفة مسموح بها, محلات تجارية . يمكن للنزلاء الاختيار من ضمن مجموعة من الغرف المصممة بعناية لتعكس جواً من الراحة، والتي يتجاوز عددها 3. صممت خدمات الاستجمام في الفندق والتي تتضمن حمام سباحة خارجي, حديقة لمساعدتك على الاسترخاء والراحة. إن كنت تتطلع إلى إقامة مريحة وهادئة في Badger Creek، فستجد في Lavender Farm Hotel بيتك الثاني. We enjoyed the stay primarily because of the homemade bread and cakes provided, access to the owners fruit and vegetable garden and the quiet location. However, the place needs a proper clean and updating as some of the outside furniture is a bit ragged and it all looks a bit uncared for. we are happy our stay at lavender farm hotel. The dogs were great guest relation officers, but credit also goes to Tony & Cathy (sorry, did I get your names correctly) for ensuring that our stay was pleasant. I can't recommend Lavender Farm enough if you are after accommodation in the Yarra. 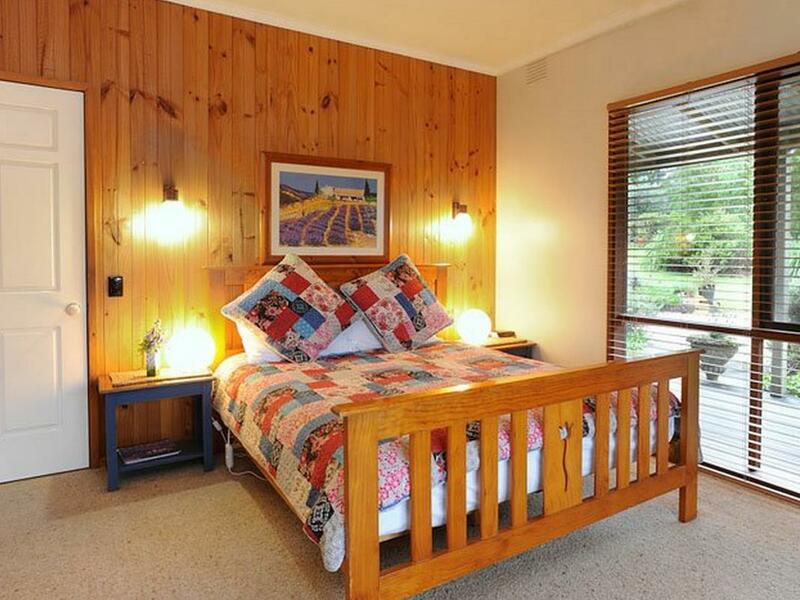 The location is super convenient with wineries and the Healesville town centre just a short drive away. However, the Farm is almost too perfect to leave. Tony and Jacky have got everything covered to make you feel relaxed and at home as soon as you arrive. There was nothing to set up. Towels, sheets, the fireplace, bacon and eggs in the fridge, artisan bread in the pantry, even a fresh cake on the table! We felt so welcome and comfortable at the Farm. A beautiful place to stay with so many lovely flowers, friendly animals and a warm, friendly feel. Though we only stayed a night, we left feeling like we'd been away for a week! We'll definitely be back. A lovely accommodation hidden away in a quiet spot of Yarra Valley. The place is very homely and the staff/owner is very helpful in making our stay a memorable one. The house is big and cosy with a nice fireplace. Overall, it is a value for money place. Would love to come back again. Before check in, me and my partner visited Healsville Sanctuary. Perfect for children and plenty to see and do there. Only a 10min drive from there to Lavender Farm. Upon arrival we were greeted by the hosts two very friendly dogs. The house had rustic charm and dashes of lavender were everywhere. The lavender soap and fresh flowers and fruit were a welcomed touch. A fully capable kitchen allowed us to cook dinner and bacon and eggs were supplied for a lovely breakfast. Enjoying a relaxing spa bath while watching the sunset was a highlight for us. Waking up every morning to the native birds and a fire place was an amazing feeling. Very close to local shops, we highly recommend the local Chinese restaurant(Cherry Tree), and there were many treasures to be found in the shopping strip from the jewelers to the candle store.Highly recommended to nature lovers, the grounds are amazing with a dam and horses. Only two small issues to comment on, the towels were tradition 'hotel' towels and barely absorbed any water after a shower. They property has a septic tank and it was a little smelly on the last morning. Overall, we will definitely visit again but will bring our own towels.